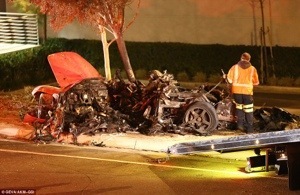 Sources connected to Always Evolving — the auto shop co-owned by Walker and the Porsche driver Roger Rodas say the sports car crashed as a result of mechanical failure. After investigating the remnants of the vehicle, they believe it had a steering fluid leak. The auto shop stored the vehicle. Apparently, they saw evidence of a fluid burst and subsequent fluid trail before the skid marks at the accident scene. They claim there is an absence of skid marks until just before the point of impact. They say if Roger had lost control the skid marks would show swerving, but instead the marks were in a straight line. They feel this cements the theory the driver didn’t have steering control. Another thing that was so suspect is that the fire spreading so quickly in the front of the car. The sources say flames would be expected in the rear where the engine is … but fire in the front reinforces their theory of a fluid leak of some sort. TMZ claims the $500,000 Porsche Carrera GT was NOT modified and was driven rarely so they believe any failure must be a factory defect. Another close source said, “Roger was a world class driver” — and while he might have been speeding, as cops have said, the notion he just lost control, doesn’t coincide with the street debris, skid marks and vehicle remnant evidence. 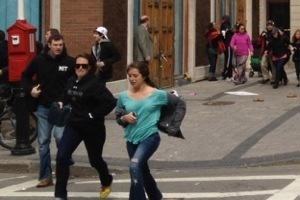 The man identified in the earie Photo walking away from the Boston Marathon explosion says that he is not the bomber. In fact, Salah Barhoun, 17, went to police to plead his case. He says he was shocked to see a photo of himself ( circled in red) walking away from the explosion, blasted all over the Internet and news. He says he was just there to watch the marathon. Yesterday, The New York Post ran a story featuring a picture of Barhoun and another man circled in red, but said it was unclear if they were the same as two potential suspects spotted by law enforcement Wednesday. Although not circled in red here, however the suspect is wearing the white hat.